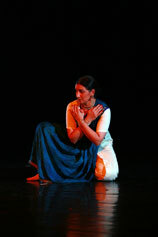 Several repeat performances as work in progress since 2011 in India and Europe. Festival inMotion Asia-Pacific-Weeks Berlin 2005, with several repeat performances in different formats since then. Music: Neela Ramanuja (vocal), S.V. Giridhara and ensemble (Indian percussion), Ravichandra Kullur (Flute), Nandkishor Muley (Santur). Funded by the District Cultural Department of Berlin-Steglitz and in collaboration with State Museums Berlin www.narthaki.com "Between East & West: Rainbow Melodies over Dance Theater Skies" (Review of R. Ramesh's Bharatanatyam performance in relation to contemporary Tanztheater and to some of Rudolf Laban's concepts; by C. Fernandes), June 2002. Theater Karlshorst, Werkstatt der Kulturen, Berlin. Funded by the Berlin Senat - Senatsverwaltung für Wissenschaft und Kultur Werkstatt der Kulturen, Asia-Pacific-Weeks 1999, Internationalem Theaterfestival Berlin. Music: Several musical scores with Mila Morgenstern (Base Flute, Bansuri), S.V. Giridhara (Mridangam, morsing), Nandkishore Muley (Santur), Neela Ramanuja (vocal), with recorded Indian orchestra, etc. 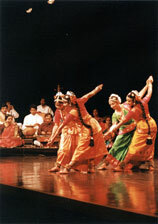 Premiered in Bangalore, 1998 and Berlin 1999 (funded by District Cultural Department of Berlin-Schöneberg), with repeat performances at State Theater Winsen/Luhe (2000, for Goethe's 250th anniversary), COCA, St.Louis, USA (2002), Jaipur and Hyderabad (2003), Berlin (2002, 2005, 2007), Frankfurt/Oder (2010). Funded for the Schöneberger Tanznacht by the District Cultural Department of Berlin-Schöneberg.